Catch up on the Event of the Year! Discover the series that has everyone buzzing with this introductory priced trade paperback collection released to coincide with the beginning of the second chapter of the yearlong event! Separately, thirteen mystical Artifacts will guide the fate of the Universe. Together, thirteen Artifacts will end the Universe. When a mysterious antagonist kidnaps, Hope, the daughter of Sara Pezzini and Jackie Estacado, Armageddon is put into motion. 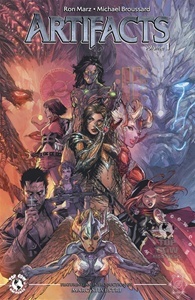 Starring virtually every character in the Top Cow Universe, this is a series for diehard fans and new readers alike. 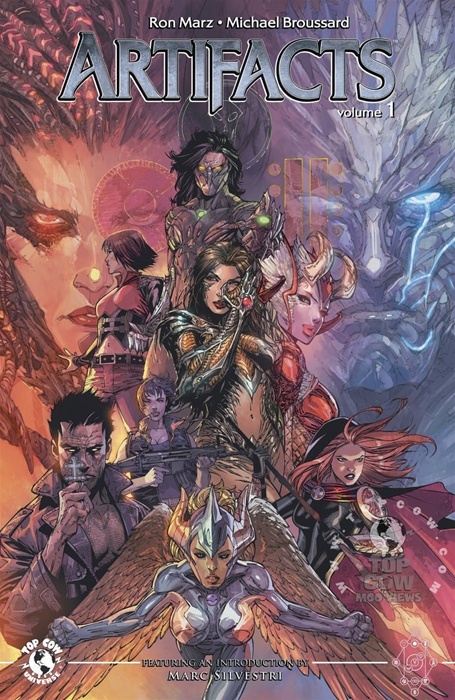 Written by Top Cow Universe architect Ron Marz (Witchblade, Magdalena) and featuring art by Michael Broussard (The Darkness), this volume collects Artifacts #1-#4 along with the Free Comic Book Day #0 issue and a beautiful cover gallery, behind-the-scenes extras, and much more!